It is hard to keep updated with all new blogging platforms that get released each time. Many new platforms are introduced in the web and thus it becomes little difficult to fetch the worthy. 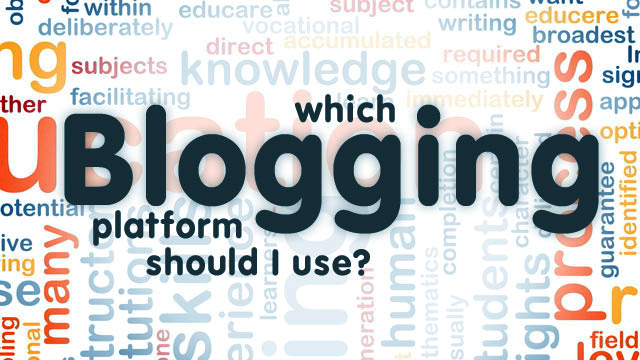 In accordance to that, let’s check out six new blogging platforms that help you a lot to improve your traffic more. The first newest blogging platform called SETT is centered on community and long time bloggers can interact with the higher quality commentators and contributors. This site is best to attract the right audiences to your site and thus resulting in considerable success in your visiting rate. This one is more or less like WordPress with less basic and bit fancier in design. SETT refers readers to your site from the time you have signed up with it and provides you with much more facilities like tracking comments, receiving private messages from other community, etc. It also has a system called word-matching system which compares one post from another. Thus, if the readers like your post it shows the similar suggestions to keep them more interested. So, if you want to gain more audience, and wish to communicate with other bloggers, then SETT will be the right choice for you. If you like the simpler way of blogging with common basics and design then this site will the better choice for you. Postagon shows your blog simpler with no fluffs or worries. This appears clean on all the devices and offers fast and reliable posting without any support of apps. It is free to join and that itself will provide you with many features that can be used to boost up your blog’s appearance. It also has visual and markdown editor, Google analytics, RSS feeds and social sharing which allows you to personalize or customize your blog’s look and feel. You can also share your post through email, Tumblr, Facebook and other social networks. Roon’s interface and layout is similar to Postagon. There is a black canvas that fades away when you start writing your post. This site provides you with different designing techniques like styling at the bottom which is very simple to use. This can also be used in mobiles in which it can be downloaded in the form of app. Moreover, Roon focuses more on your content and always check whether your writing is center staged. It is for free, and offers many features like Google analytics just like Postagon. You can add a short biography, a link of your post and your twitter username for commenting which is really pretty good to know. Among all, the easiest blogging platform is Postach.io. You can publish any thoughts that you have already come across with Evernote application. No need to know any content management system, instead simply pick up a notepad, add a domain name, and then any tag notes to share your comments. Even if you have not used Evernote you can directly sign up with this site and it directs you how to use it. They also guide you in designing your page using simple inline CSS of HTML. They offer you with many features like Google Analytics, disqus commenting, etc, just as above mentioned sites. Also, you can customize your pages by adding your favourite pictures and themes. Also Read: How to get More Comments on Blog? This blogging platform sounds crazy by its name and it is built by John o’Nolan who worked for two years as deputy head of WordPress interface team. Ghost has a beautiful dashboard that shows your blog more pretty in look and feel. It has split screen writing function where Markdown is on the left and active preview is on the right side. You can also drag and drop the images in your post and they exactly appear the same as you designed. You can also add tags if you desire just by clicking the buttons at the bottom. Ghost works under these three principles. Ghost is being made for love and not profit. The ultimate aim of Ghost is to provide the writers a simple and easy platform that takes the writers to the next successful level. It’s a platform for basic, quick, easy publication of your content. If you really miss posteriors, you can better start using posthaven, made by posteriors co-founder, Garry Tan for $5 per month. Garry has promised that this site will never shut down and continuously provide people with best and special offers to stick over to this site. Since, WordPress has made a move towards other websites and content management, it is good to see many new platforms emerging in the blogging field. Glad you like these, 6 new blogging platform to improve your traffic rate of blog. Subscribe Here to get blogging updates within your mail box.